Home > INVISIBLE ZIPPERS > BRIDAL ZIPPERS > #6 Sea Glass Invisible - 30"
Sea Glass #6 Invisible Zipper - 30"
Sea Glass is only found as a #6 invisible on my site. It is a pale light aqua with a bit a green in it. Or a light spa with a little gray in it. Fast becoming one of my favorite colors! Vera Wang uses this weight invisible zipper in her wedding gowns for extra security. #6 is 6.2 mm across the closed teeth, BUT an invisible zipper is NEVER as strong as a standard coil zipper! If you are building a tight bodice on a gown, you are better to build an inner bodice with a SEPARATING or jacket zipper on the inside attached to muslin THEN use an invisible zipper on the outside fabric/lace to hide the architecture & engineering on the inside. 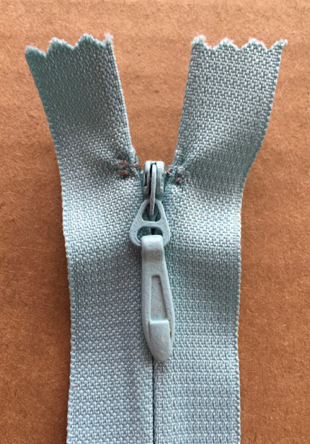 Invisible zippers are easily cut down to the length you need. Sewing from the neckline down, any extra zipper is easily trimmed from the bottom of the zipper.